The number of mobile subscribers in India are rapidly increasing. Its very rare to find someone without a mobile phone these days. This explosive growth in mobile phone users have led to an increase in receiving phone calls from unknown people and phone numbers. If you got a missed call from an unknown number, then its never a good idea to call back to that number to find out who called you. Fortunately, there is a way to find more details and trace a mobile phone number without calling back. 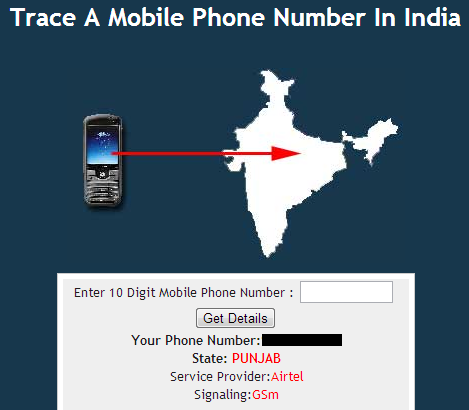 Simply, go to this tool to trace mobile phone number location in India, and enter your mobile number. Note that you just need to enter your mobile number and no need to add a zero in front of it, irrespective of your location. Click Get Details button and the mobile number tracking tool will instantly display the location of the mobile number you entered. Along with the location (state), it will find the name of its mobile operator, the signaling type (GSM or CDMA). This mobile number tracer tool is very fast and accurate and is being updated every month to include the new series phone numbers introduced by TRAI. Now you can easily find more details about a missed call from an unknown number, or track the location of a prank caller and someone who have been sending you those annoying sms messages. Just use the tool to trace mobile phone number in India. We have been getting a lot of questions about this mobile number tracing tool. Here’s a list of some of the most frequently asked questions and their answers. • Is it possible to find out the exact location of a mobile phone number? Why do you show only the state of a mobile number, can you show the city, district or exact address of the mobile number? Can we find the name of the person who owns a mobile from the mobile number? Its impossible to trace the exact location of a mobile number using this tool, or any other available tool. This tool will only display the circle of the mobile number where it was first registered. Generally a person will register a SIM in the state where he/she lives, the tool is very accurate in tracking the location of a mobile number. Its impossible to trace city, district, address or any other geographical details or name of the person using a mobile number as its not stored anywhere. • There is this abc tool which is much better then your mobile number tracer. It even displays the name of the mobile owner and its exact address. So stop saying that its not possible to show those details and add these to your tool. There are two type of such ‘exact location tracking’ tools available currently. First are mobile apps that display the name and address and many other details of a person just from its mobile number. These apps work like this: When you install any such app on your mobile, they take all the information in your phone book and saves it to their server. As more and more people install the app, their database starts growing and one fine day, they can show you the name and address of any phone number in India. You can try these apps, but I will not do it personally due to privacy issues. Second are those apps and tools that ask you your name, address and mobile phone number before they allow you to trace the location of any other mobile number. Next time if someone tries to trace ‘your’ mobile number, they have all the info to display. Thus, these apps and tools are basically robbing peter to pay paul. I will also not use any such mobile tracking apps and tools for privacy issues. Since we value the privacy of our readers and visitors, we do not follow these methods, and thus we can only show the info that is ‘safe’. Update: There are also some ‘safe apps’ that help you track the location of a mobile number. For example, this Android app lets you find the current location of a phone caller from its mobile number. We regularly post about such apps and many other useful apps. Subscribe to HackTrix to stay updated. • Can we find the IMEI number of a mobile number using this mobile tracking tool? No. You can find IMEI number of a mobile number only if you have a physical access to a mobile phone or the box in which it came from the vendor. • Is this real time tracking or tracking of a mobile number? Is it geo-location service? No, this tool doesn’t tracks the location of a mobile number in real time. It simply displays the location (state) where the mobile number was first activated. • You say that you trace the location of a mobile number to its state? Does this state location changes if the person who owns the mobile number moves to another state? That is, does this mobile tracing tool works if the mobile is in roaming? No. As posted above, this tool does not track the mobile number in real time. • Are you maintaining a mobile number directory service? You can consider this as a mobile number directory service but internally we use an algorithm to trace the location and service provider details of a mobile number. • Now that mobile number portability is available in India, how can this tool display the name of the service provider and signalling of a mobile number exactly? That’s right. We do not claim accuracy. This tool displays the first data. That is, it displays the location, service provider and signaling details when the mobile number was first registered. • I have lost my mobile phone, can this mobile tracing tool find its exact location now? Can you help me locate my lost phone? This tool cannot help you track or trace the location of your lost mobile phone. You can learn how to track or trace lost iPhone, track or trace lost Android phone, track or trace lost Windows phone. Also check out this article where its explained how to trace a lost mobile from its IMEI number. • Someone is giving me threats over phone, can you help me trace the location of this person? Someone is sending me mischievous sms messages, can you help me track the location of this person from its mobile number? As posted above, its not possible to trace the name or address of a person from its mobile number. Please contact your nearest legal authorities if someone is harassing you over phone. • This tool is showing incorrect result for my phone number. This tool is showing ‘invalid phone number’ for my mobile number even though it is valid. A specific series of mobile numbers that was recently introduced is not supported by this mobile number tracing tool. When will you update it? Please report the details using the comments form below and we’ll try to update the tool as soon as possible. Thank you for keeping the tool to trace mobile number in India up-to-date. • I just checked and I can’t trace a mobile number from xyz country with this tool? Currently this tool only supports tracing of mobile numbers from India. If you have any questions about this tool or about tracking mobile number location in India and you can’t find answer to your query in the FAQ above, please feel free to use the comments form below to send us the question and we’ll be glad to help.